Wrocław has always been the dominant capital of Silesia, a region whose story begins with the establishment of a stronghold along the Amber Road and Via Regia trading routes on what is today Ostrów Tumski by the Slavic Ślężanie tribe in the 8th century. Absorbed into Czech Bohemia, the expanding fortress was first recorded in the 10th century under the name ‘Vratislavia,’ thought to be derived from the name of the Bohemian duke Vratislav I. In 990, however, the Piast duke Mieszko I conquered the region and by 1000AD the city had expanded to 1,000 inhabitants, prompting Polish king Bolesław I to establish Silesia’s first bishopric on the site of today’s Cathedral of St. John the Baptist. Over the next century, religious and political conflict saw the region pass back forth between Poland and Bohemia numerous times, before finding some stability under the Silesian Piast dynasty who ruled the area during the so called ‘Age of Fragmentation’ (1138-1320) when Poland was divided into autonomous principalities. A Mongol raid in 1241 devastated the city, but it was rebuilt under Magdeburg Law with city planners expanding it to incorporate many of the outlying settlements, shifting the city centre away from Ostrów Tumski (which became the city’s religious centre) to the other side of the river, building a moat and defensive walls around it, and laying out the market square as it appears to this day. Settlers flocked to the city, and ethnic Germans soon became the most dominant demographic. The Piast line petered out in 1335 when Duke Henryk VI died without an heir and earlier treaties dictated the transfer of the region to Bohemian rule once again. Under the Luxemburg dynasty the city generally prospered, but the dominance of the merchant class, which controlled the Town Council, lead to strife with the church and lower classes resulting in outright revolt in 1418 when guildsmen stormed the Town Hall and beheaded the mayor. Printing with movable type began in 1475, with many variations of the city’s name appearing, including Wretslav, Wratislav, Prezzla, Presslay and Bresslau. By 1526 – when Bohemian King Louis Jagiellon’s death ended prolonged fighting over Bohemian succession and transferred the city to the Austrian Habsburg dynasty - the Reformation had reached the Silesian capital and Protestantism had become the dominant religion. During the Thirty Years War (1618-48), the city fought to maintain its Protestantism, and though occupied, eluded physical destruction, emerging from the conflict as one of the only Silesian cities to remain Protestant under Habsburg rule. However plague and war had taken their toll on the population, cutting it in half. During the Counter-reformation, many Catholic orders were encouraged by the emperor to settle in Silesia’s capital, including the Jesuits who founded the Wrocław Jesuit Academy in 1702, which would later grow into today’s Wrocław University. During the War of Austrian Succession, the Kingdom of Prussia laid claim to much of Silesia and Prussian troops entered what was then known as ‘Breslau’ without a conflict in 1741. Though heavily taxed and having lost the self-rule the city had enjoyed since the Middle Ages, Protestants could now express their faith freely in the new kingdom and Prussian authorities allowed for the establishment of a Jewish community. After the demise of the Holy Roman Empire, Breslau capitulated to Napoleon’s army in 1807; led by King Frederick III of Prussia – who lived in Breslau – the city was the centre of the liberation movement against Napoleonic rule. The tearing down of Breslau’s defensive fortifications by the French allowed the city to begin expanding and state reforms helped it prosper in the 19th century as it grew into a major administrative, ecclesiastical, military, industrial and science centre. Over the course of the century the population increased 8-fold (including the third largest Jewish population in Germany) and Breslau grew into the second largest city in Prussia; when the German Empire was consolidated in 1871, Breslau entered as the third largest city after Berlin and Hamburg. The construction of the Centennial Hall in 1913 perhaps best represents the ambition and achievement of this part of the city’s history. By being behind the frontlines of WWI, Breslau avoided damage and was even able to recover quickly from the economic impoverishment that came with the end of the conflict. In 1930 it was chosen to host the ‘Deutsche Kampfspiele’ – a showcase of German athletics after Germany was banned from the Olympic Games. The Nazi Party developed one of its largest support bases in Breslau, which played a large role in voting them to power in 1933. In 1938 state-organised persecution against the city’s minorities, particularly Poles and Jews, began in earnest and those who did not escape were killed or sent to the network of concentration and forced labour camps set up around Breslau, where many would die later. Safely removed from the frontlines of WWII, Breslau became a haven for refugees and its population swelled to close to one million. In August 1944, with the Soviet Army approaching, the city was declared ‘Festung Breslau’ – a closed fortress to be held at all costs. When Nazi Commander Karl Hanke lifted a ban on the evacuation of civilians in January 1945 it was too late: railway connections had been destroyed or were overcrowded and tens of thousands froze to death in minus 20 degree ice storms. Some 200,000 civilians remained in the city as the Soviet siege began in February; the Siege of Breslau lasted 82 days before capitulation occurred on May 6th, 1945. It was one of the last German cities to fall, outlasting Berlin by four days and the war in Europe officially ended only two days after Breslau’s defeat. 50% of the Old Town was in ruin and the western and southern suburbs were 90% obliterated. Tens of thousands had died defending it. Under the terms of the Potsdam Conference, Lower Silesia passed to Poland and its largest city became known as ‘Wrocław.’ Poles began arriving immediately as forced deportations from Eastern Polish lands annexed by the Soviet Union and the forced expulsion of Wrocław’s German population took place simultaneously, leading to a huge influx of Eastern Poles into Wrocław, particularly from Lwów (now Lviv, Ukraine); Polish cultural treasures from Lwów came with them including the Fredo monument on the market square, the Racławice Panorama painting and the collection of the Ossolineum library. A long period of reconstruction followed, characterised equally by Polonisation and de-Germanisation; all German monuments and inscriptions were removed and Wrocław’s non-Jewish cemeteries were destroyed. At the same time Sovietisation was also beginning: businesses were nationalised, Polish political and religious leaders were imprisoned and following rigged elections the full communist takeover of Poland was complete by 1948. The Communist authorities took full credit for restoring Lower Silesia and boasted of their success rebuilding the city and incorporating it into the Soviet system; this was typified by Wrocław’s hosting of the propaganda parade known as the Recovered Territories Exhibition in 1948.
r water. 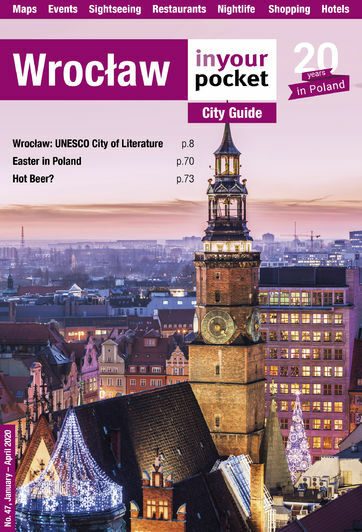 Poland joined the European Union in 2004 and Wrocław has emerged as one of the country’s leading cities, attracting significant foreign investment. The city was chosen to host matches during the 2012 European Football Championships and the entirety of the 2017 World Games in addition to serving as the 2016 European Capital of Culture.